When your tooth is damaged or misshapen, dental bonding can be a quick, painless general dentistry option to repair your tooth. At Dental Care Center at Kennestone, we offer several options for tooth repair, including dental bonding. Using a special dental resin, we can replace missing tooth pieces or change the shape of a tooth for cosmetic purposes. 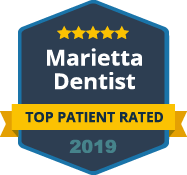 This can usually be done in one appointment at our office in Marietta. Dental bonding for tooth repair uses resin to add strength and protection to your damaged tooth. Dental resin is made from plastics and can be formed to fill chips in teeth or add protection over cracks. The resin is shaped and then adhered to your tooth through a bonding process. We use resin that is color-matched to your tooth to keep your smile white. Dental bonding can last for many years, and it is a painless procedure that is valuable for repairing many types of tooth damage. Dental bonding is an affordable option to change the shape of your teeth or cover discolorations for cosmetic purposes. Gaps between front teeth can be filled by adding resin to the teeth, which closes the gap. Dental bonding can be used to cover stains that do not respond to whitening treatments or to fix other dental flaws. Cosmetic dental bonding can achieve many of the same results as porcelain veneers at a less expensive cost. The procedure can be done in one visit, which is perfect for when you want a cosmetic repair done quickly. If you need a tooth repaired or want to explore improving the appearance of your smile, ask our team about dental bonding. 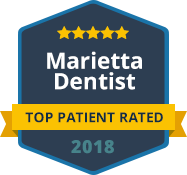 We offer many options for tooth repairs and cosmetic changes for your smile at our office in Marietta. Contact Dental Care Center at Kennestone today to schedule your next appointment.